P Sanjana, who took a five-minute break after every hour, looked weary after two hours but she refused to give up. Around two hundred students were cheering the little girl all along. 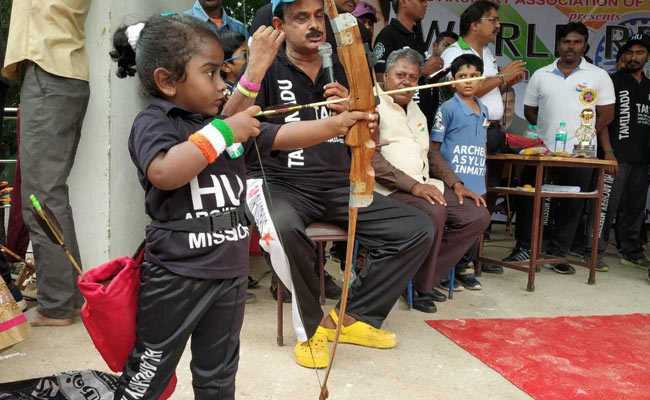 A three-year-old girl in Chennai attempted a Guinness World Record this year on Independence Day by shooting 1,111 arrows on a target eight metres away. It took P Sanjana, a student of lower kindergarten, three and a half hours to finish, and on most occasions, she did not miss her target. "I am happy. I've no pain and I'm not tired. My dream is to win a gold in Olympics," the three-year-old told NDTV after the feat. She got injured on her foot but that did not deter her. P Sanjana, who took a five-minute break after every hour, looked weary after two hours but she refused to give up, said her coach Shihan Hussaini. "It was her will power, stamina and focus that made the feat possible. There's no doubt she can be an Olympian. The state and central governments should give her the best of the facilities," he said. P Sanjana's father Premnath works at a government hospital in Chennai and her mother is a housewife. It was the three-year-old's fascination for bows and arrows that her parents decided to nurture her interest in archery. Her mother Swetha Premnath is keen to hone her potential as an Olympian. For the last three months, the young girl has been practicing after school every day. "Human beings are capable of doing so many things. Just because no child has tried we can't say we've pushed her," Mr Hussaini explained. Around two hundred students were cheering the little girl all along at the MGR Janaki College where she was attempting the Guinness Record. The South Asia Archery Association nominated G Shankar as the official observer. "The international body would submit details to Guinness seeking recognition. We've documented every little detail," he said.